In December 2016, Thaye Dorje, His Holiness the 17th Gyalwa Karmapa, presided over the Kagyu Monlam in Bodh Gaya, the place where the historical Buddha Shakyamuni attained enlightenment. Karmapa physically met thousands of his students in Bodh Gaya, and connected with hundreds of thousands of people digitally through streaming the Monlam live on Karmapa’s official Facebook page. Karmapa led an empowerment; conducted rituals important for the Karma Kagyu lineage; visited pilgrimage sites; paid homage to the historical Buddha; and performed other activities coordinated through his official charity, the South Asian Buddhist Association (SABA). 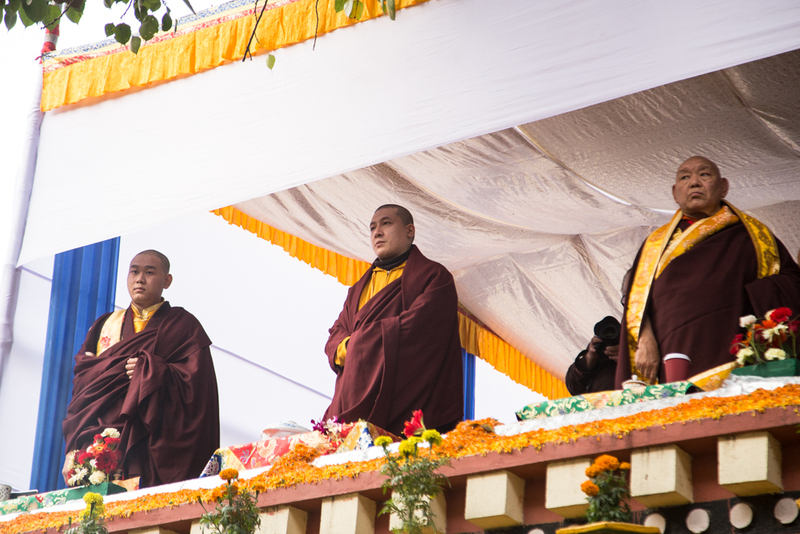 Karmapa arrived in Bodh Gaya on 7 December. 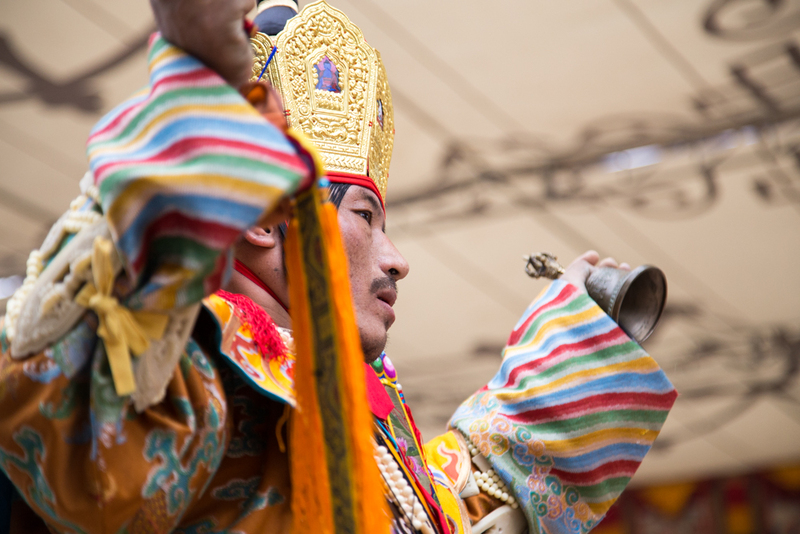 In the days leading up to the Kagyu Monlam, a five-day Tsechu Puja – an extensive ritual of Guru Rinpoche – was held at His Eminence Beru Khyentse Rinpoche’s monastery. The puja concluded with two days of Lama Dances by the monks of Rumtek Monastery and Beru Khyentse Rinpoche’s monastic sangha. Rumtek Monastery is the main seat-in-exile of the Karmapa. The essence of the sacred dance is to recognize that the nature of all phenomena is the union of appearance and emptiness. 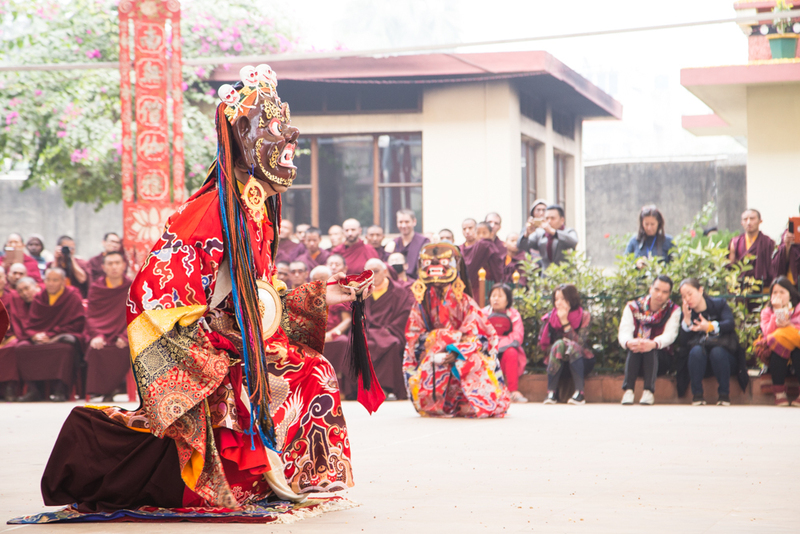 The dancers visualize themselves as Buddha forms, and express this through the dance itself, planting the seed of liberation in the audience. 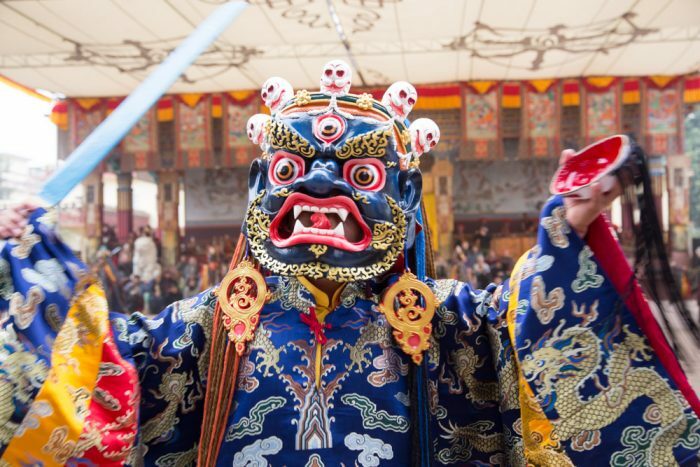 The elaborate ceremonies involve colorful costumes, masks and ornaments of various peaceful and wrathful Buddha aspects. They involve a great variety of dance steps, gestures, chants and musical instruments. Observe the children around here. Take notice of how they see the performance. Without any strong labelling, they are enjoying their time. As we get fascinated by the colorful display of the performance, we immediately label the display and our experience as “good”. We all do that. Both the spectators and performers are in the same boat — we believe we are displaying something, and you believe you are participating in something. It is a ritual, an exotic ritual. We are accustomed to rituals — from dawn to dusk, we are engaged with the rituals of brushing our teeth, eating meals, drinking coffee, and so on — all the time. Tired of the old rituals, we create new rituals. Eventually, we get tired of those, too. The ritual performance you are observing now is a new experience. It is exotic, grand, and powerful. We may be taken in by the scene. It may be overwhelming for some. But eventually we may get tired of this too; our eyes get tired of seeing the dancers move left and right, circling round and round, repeatedly, and our eardrums get tired of hearing the constant drumming. There is wisdom in reflecting on our mental attitude. There is an understanding in that. The performances carry a codified message. In reality, everything is drama, a magical display, and we can observe the performances, alluding to the illusory nature of reality. But when we become fascinated, we instantly judge, we instantly label, at which point the ritual performance becomes just an exotic dance. That said, we still believe in the hidden benefits, hence we are here, participating; we make aspirations, wishes for a successful life, a new friendship, a better society, and so on, and there is tremendous benefit. But at this very moment of the event, we should not be fascinated. We should remain in non-judging awareness, a state of mind that takes this display as a codified display of what reality is – an illusion, a drama. An hour before the ceremonies started, on 11 December, Karma Temple was already full of expectant devotees. When Karmapa, His Eminence Jamgon Kongtrul Rinpoche, and the other Rinpoches and lamas had taken their seats, the ceremony started with the Guru Yoga of the great yogi Milarepa. Jamgon Kongtrul Rinpoche and his father Beru Khyentse Rinpoche made symbolic offerings representing enlightened body, speech, mind, qualities, and activities to Karmapa. 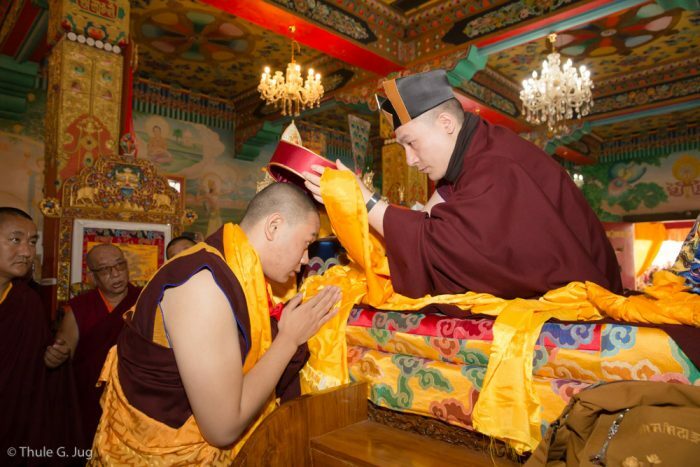 Karmapa then placed the red Activity Hat on Jamgon Kongtrul Rinpoche’s head (not to be confused with the Red Crown of His Holiness Kunzig Shamar Rinpoche, Karmapa’s late teacher and fellow lineage holder). This historic moment symbolized Rinpoche’s role as a holder of the Dharma transmissions of the Karma Kagyu lineage, and in particular the lineage of monastic ordination. On 12 and 13 December 2016, the Second International Karma Kagyu Meeting took place in Bodh Gaya, at the instigation of Thaye Dorje, His Holiness the 17th Gyalwa Karmapa. Representatives from various monasteries, dharma centres and regions from around the world were invited for two days of exchange. The theme of the meeting was “Timeline”: the journey of Buddhism in general, and the Karma Kagyu lineage in particular, across the centuries and continents. Around twenty-five individuals – Rinpoches and lamas, monks and laypeople – from East and West were invited to talk about their relationship with the Karma Kagyu lineage and what it means to them, personally and spiritually. The list of speakers included Prof. Sempa Dorje, Beru Khyentse Rinpoche, Venerable Shangpa Rinpoche, Venerable Sherab Gyaltsen Rinpoche, Venerable Nendo Rinpoche, Khenpo Chodrak Tenphel, representatives from the Himalayan regions and various centres in Europe, South East Asia and the USA. Karmapa’s concluding address emphasized awareness and acceptance of impermanence as the basis for any form of activity. The Four Seals that the Buddha taught, the first one says, ‘All Compounded Phenomena Are Impermanent’. And I can see, I can feel that all our answers lie exactly there. We don’t even need to take a step towards searching for or finding this at all. Right here, where we stand, we can see impermanence. And one of the greatest examples is the passing into parinirvana of our teachers, our spiritual masters, our spiritual fathers. We don’t have to go back very far: just a little over two years ago we saw the greatest loss, the greatest parinirvana, and between that year and now we have witnessed the parinirvana of many great masters. And if we really look closely, it is extremely moving. But no matter how sad it is to encounter such a situation, there is always something we can extract from it, something extremely valuable, in fact invaluable, which is that it’s a physical way of showing that things are truly impermanent. It is not a good thing, it is not a bad thing, it just is. It just tells us where we stand, where we came from, and where we are going. It tells us everything: our past, present, and future, right there. The reason why I’m saying this is that we all have a yearning, a sense of urgency. We do realise facts, such as that we need a sense of belonging, to have a sense of being together, being united – whatever terms we use. We all have a sense of that, and then towards that aim we all have gone through all kinds of hardship. But where did that lead us? Are we happy here now? It’s difficult to say. And if we continue like this, will we be happy? Will we be happy if we become more successful? Again, I’m not so sure. What I’m trying to say is that before we begin any kind of idea, before we take any kind of step, we first need to know where we stand. If we don’t understand that, we can take thousands of steps, millions of steps, but to no end. But if we know where we are standing and from where we are taking the first step, then it’s worthwhile, however many steps we take. It could be just a few, but they are very, very meaningful. So the first thing to do is to gain some sense – a direct sense, if possible – that all compounded phenomena are truly impermanent. To see that at this very moment where we are walking and talking we are truly impermanent. The nature of things is like that, and if we are somehow able to get in touch with that nature, that everything is truly changing, that everything is truly impermanent, then on the basis of that we can build whatever we would like to build – organisations, trying to unite everything under one umbrella, have a system, or whatever. There is no restriction at all, there is no limit at all – as long as it’s going to benefit sentient beings we can do it. But before we take that step first we really have to understand where we are. Unless we understand that, it’s kind of futile. Following Karmapa’s wish to hold this meeting every year, everyone is looking forward to convening once again in December 2017. The Kagyu Monlam itself attracted thousands of students, lay and monastic, from India and around the world. Many high lamas assisted Karmapa in the ceremonies. During these few days, the traditional offerings of blankets and food to the poor people of the area were conducted. Karmapa made visits to significant local Buddhist sites, and gave the empowerment of Tsepame, the Buddha of Limitless Life, to more than 7,000 people. And of course the main activity was everyone reciting together the King of Aspiration Prayers by Samantabhadra. For the first time ever, students could join in with these prayers by Facebook Live video streaming. You can view a video of the first day below.